Chinese food can be such a challenge when dining out if you are gluten-free. I miss calling in an order for Chinese carryout. 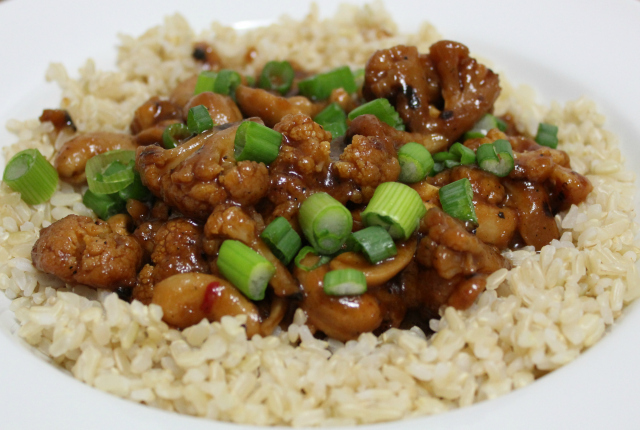 Recently I’ve been cooking Chinese or Chinese-American dishes at home and want to share a recipe with you today: Chinese Cauliflower in the Slow Cooker. 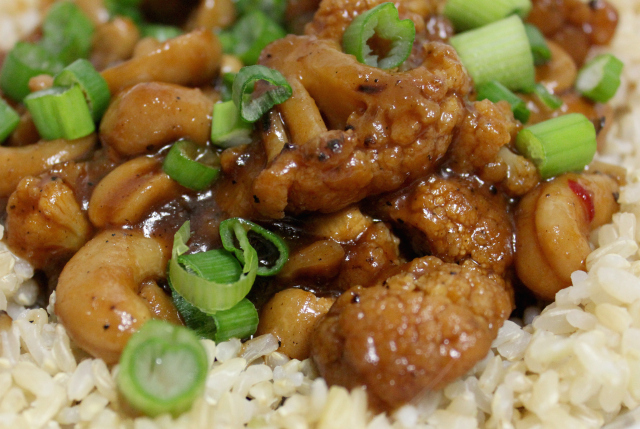 Quite similar to Cashew Chicken with all of the vegetable goodness of cauliflower instead of chicken. Plus it’s a slow cooker dish–perfect for our full lives! Speaking of slow cookers, a friend asked me recently if I have a fancy pants programmable Crockpot. I do not. I have a small army of very basic Crockpots, from tiny dipper size to this one that I use for cooking most of the soups, stews and entrees that I share here. I’m sure the fancy ones are quite handy, but for $20 or $30, you can add a slow cooker to your kitchen appliance collection. Goodness, cauliflower got crazy expensive there for a minute! At one point this winter, I was seeing prices higher than $6 a head. Now I’m seeing it around $2 for conventional, a bit more for organic. I do wish more stores would price cauliflower by the head and not the pound so I don’t have any surprises at the checkout. I may try again this summer to grow cauliflower. It’s always been a garden challenge for me. Do you have any cauliflower growing tips for me? Alright, let’s move along to the recipe. I hope you enjoy this dish as much as we do here! Have your slow cooker out and ready to go. In a large ziploc bag, place cornstarch and pepper. Close and shake to combine. Add cauliflower florets and shake to coat the cauliflower pieces. In a large, deep skillet, add grapeseed oil and heat over medium. Once hot, add cauliflower florets to skillet. Cook until lightly browned on each side, turning often. You are going for lightly browned, not blackened. Place cauliflower florets and cashew into the crockpot. In a small bowl, whisk together Tamari, rice vinegar, tomato sauce, sweet chili sauce, coconut sugar, garlic and ginger root. Pour over the top of the cauliflower and cashews in the crockpot. Gently stir to combine. Cook on high for 2 hours or on low for 4 hours. Serve over rice and garnish with green onions. 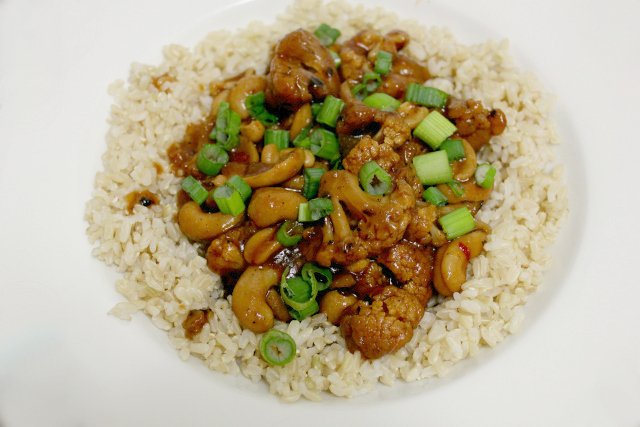 This recipe was inspired by a Cashew Chicken recipe from The Recipe Critic. I have modified the recipe to be gluten-free and vegan, changing ingredients and quantities. Full Disclosure: This post contains affiliate links. 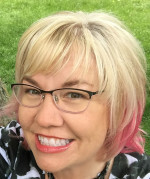 Should you make a purchase after clicking on a link in this post, I may receive a small commission. I use affiliate links to offset the expenses related to maintaining this website. Thanks for your support! I can’t begin to tell you how incredible that recipe looks, Johnna! I know I’d gobble down a plate if it were in front of me right now. Okay, maybe after the first couple of bites, I’d savor it. YUM!!! It has quickly become a favorite here! I had a bit leftover yesterday and used it as filling for a lettuce wrap. So good!